OK, so most of us have their inetpub directories at “c:inetpub”, but not all. I’m one of those people. For reasons I cannot recall, my inetpub directory is on my “d:” drive. But that isn’t a problem is it? Well if you try and install either ArcGIS Server or ArcIMS 9.2 you’ll notice that ESRI assumes that everyone has their inetpub directory at “c:”. 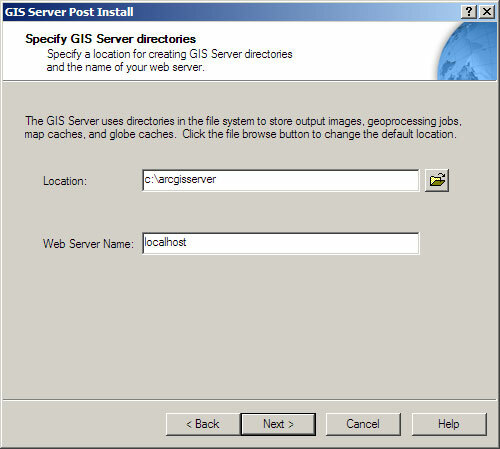 I figured this out after a couple minutes of a blank ArcGIS Server Manager page. I went into IIS Manager and noticed that Manager was pointing to “d:InetpubwwwrootArcGISManager” which of course didn’t exist. The post install was nice enough to create “c:InetpubwwwrootArcGISManager” but that isn’t where my inetpub directory is located. So I went back into the GIS Server Post Install just to double check and make sure that I didn’t miss something. And the Install Summary doesn’t reveal much. Configure as server object manager. Configure as server object container. And heaven forbid if you try and install to a computer that doesn’t have a “c:” drive. Anyway, this probably needs to be address at some point. So if this happens to you, just copy the “c:InetpubwwwrootArcGIS” folder to your IIS drive. **Update: **JT points out a KB article that explains the why and how to fix the issue. Yea, its a huge PITA. **Update 2: **Word from ESRI is that this will be fixed at the next release.